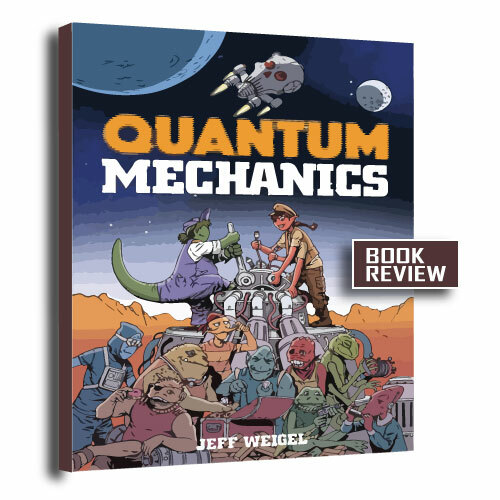 Jeff Weigel's Quantum Mechanics features two alien girls, Rox and Zam, living in a faraway corner of the universe. These girls love to tinker with machines and tech. Their love takes them into a pirate's ship and strange places in space where they face with more than they bargained for. Quantum Mechanics characters are distinct and charming. Rox and Zam's proclivities make reading the book fun. Also, the plot plays well into places you never think it'll go. Reading the book was a pleasure and the author's note at the end was a nice touch. Pre-teens, teens, and adults with a love of sci-fi will have a blast reading Quantum Mechanics. Many thanks to Lion Forge for review copy.